Street scene in Gray St. Albert Mill is visible in the background of the shot. That is Egyptian Mill chimney and tower behind Albert Mill and chimney. That will be Chadwick’s factory on the left, and Bangor Street and Poplar Street are the two streets off Gray Street further along. Prince Street is at the end; the Cotton Tree pub is now on that corner. I can add a bit more. The name on the back street looks like Back Todd Street. Todd Street, oddly, was between Haydcck Street and Back Haydock Street. I think the back street joining Gray Street and Back Todd Street is Back Rudge Street. It was somewhere around there, and there wasn’t a Rudge Street! Hi. I lived on Gray street for many years. What was the houses built on? As i was informed that they were work houses. There was a lot of spiritual activity. Was there a mill close to it & What was it called? I’m very interested in this sort of thing. Regards hope to hear from you soon. The nearest mills to Gray Street were the two in the photo, plus Mossfield Mill on Vernon Street beyond School Hill further west. Mossfield Mill’s tower was identical to Egyptian Mill’s tower as they were in the same ownership (Knowles Ltd. who also owned Peel Mills on Turton Street and those mills had another identical tower). I think the houses would be built on clay as there was a lot of that under the town. They might have been owned by the factory (not a mill) on that block which was Chadwick’s foundry. 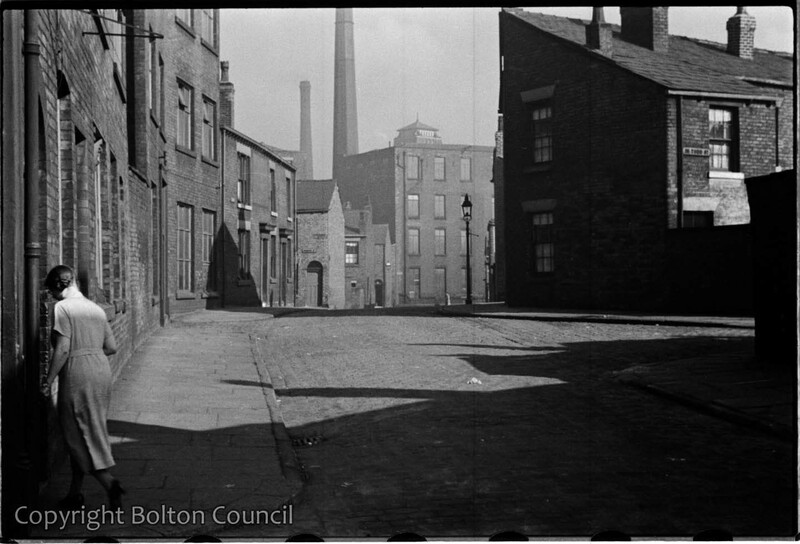 Bolton Corporation also owned some land on that block; the Public Mortuary was on the corner of School Hill and Duke Street North, and was attached to one of Chadwick’s buildings. Later, it was a depot for disinfectant storage. There was also a medical baths on the Duke Street North side (according to an OS Map) but I can’t remember that being there.